Sure, the big shows of Broadway are the neighborhood’s main claim to fame, but there are surprisingly intimate spots to be found in and around Times Square. It’s central to New York City—and to theater buffs. But there’s more to Times Square than blockbuster musicals and chain restaurants. Dubbed Longacre Square until 1904 when the New York Times set up shop there (though the paper’s now located on Eighth Avenue), this iconic crossroads also offers up some choice, chill eateries—and some cozy live music experiences, as well. Check in at the Renaissance New York Times Square Hotel, an amenity-packed retreat with a boutique hotel feel. With a modern-yet-warm Jordan Mozer-designed lobby and lounge, Aveda products and in-room technology plug-in panels, you’re in for an awesome stay that’s energized, yet relaxed. And you won’t even have to leave the Renaissance for some really special experiences, thanks to the events they bring to the hotel. 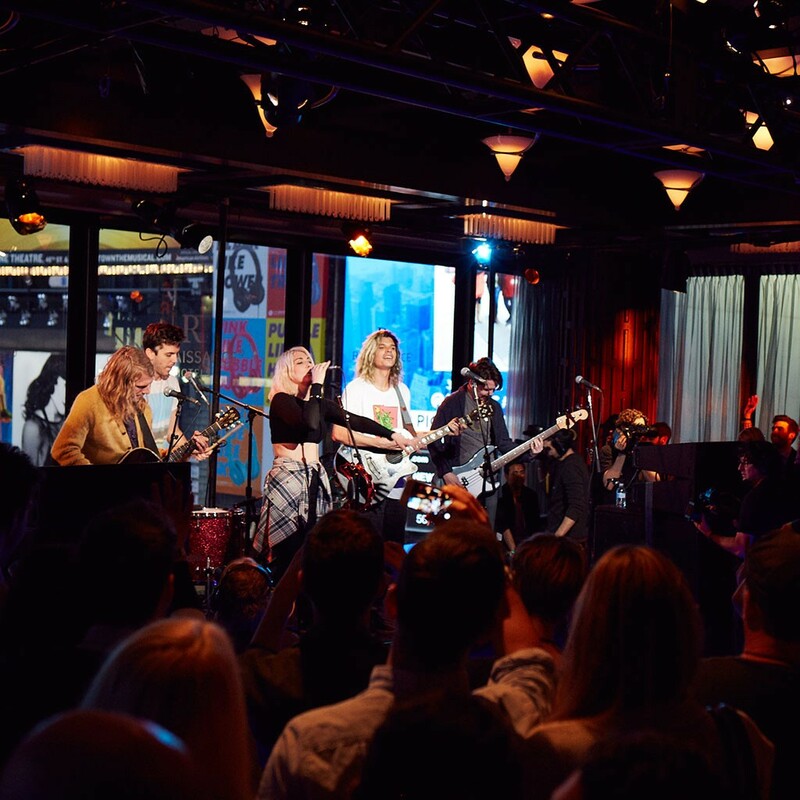 In partnership with the concert promoter AEG (well known for producing music events such as Coachella), the Los Angeles-based indie band GROUPLOVE recently played an exclusive set in the hotel’s R Lounge. In addition to the show from the Canvasback/Atlantic Records group (known for their bright sound, moody lyrics and energetic live performances), attendees admired glowing, color-saturated art from the band’s singer Hannah Hooper, an accomplished artist (her creations will be on display here all summer). Canapés were courtesy of Bromberg Bros. Blue Ribbon Restaurants®, the award-winning SoHo-based restaurant empire, and guests quaffed Tito’s Vodka cocktails called "Shark Attack" and "Tongue Tied" (in honor of tracks from GROUPLOVE’s first album and from their latest release, Spreading Rumours). Sweets were sourced from Veselka—the East Village café is a GROUPLOVE favorite, and home to the band’s must-have M&M-packed cookies. For another memorable Midtown discovery, navigate north on Broadway to Central Park South and take a quick right to find Marea, restauranteur Michael White’s award-winning ode to coastal Italian cuisine. Grab seats at the stunningly backlit, honey onyx-walled bar or in the low-key dining room and feast on ocean-fresh seafood like bigeye tuna topped with oyster crema and crispy artichokes followed by the popular house-made pasta with jumbo lump crab, sea urchin and basil. For more fun finds in and around Renaissance Hotels all over the world, check out their event listings and their online discovery tool, where you can plug in your destination city and explore local discoveries from food to drink, shopping and entertainment.